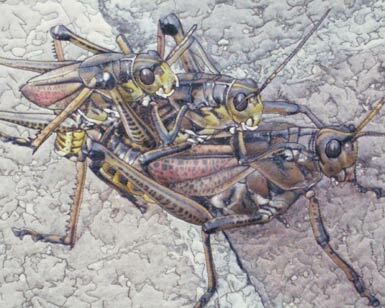 23 3/8" w. x 18 3/8" h.
On a trip to Brookgreen Gardens in South Carolina, we spotted these three Lubber grasshoppers in an unseparable embrace on one of the walkways. Always looking for imagery that illustrates a saying or song, I couldn't pass up this opportunity! It takes me back to my college years when I studied Entomolygy at Purdue as a biology major. Featured in the Fall 2006 Quilting Arts Magazine, p. 62. 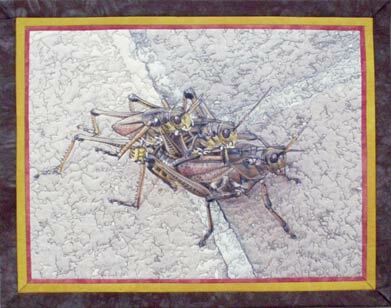 Copyrright 2003 by Barbara Barrick McKie, all rights reserved.